A route from Sydney to Canberra is commonly touted as the most viable high speed rail corridor in Australia due to its short distance and the density of regional population centres on the way. What isn’t often proposed is to upgrade and re-use the route we already have. The single-track railway diverges from the Sydney-Melbourne mainline a few kilometres south of Goulburn, and continues south through the Mulwaree Valley and then the Carwoola Plains before turning west through the Molonglo Gorge to access Canberra’s eastern suburbs. Most previous high-speed rail proposals have ignored the existing line, instead favouring a new alignment generally following the Hume and Federal Highways and entering Canberra from the north, or possibly the northeast via Canberra Airport. Presumably the assumption was that a high-speed alignment through the difficult terrain east of Canberra would be impractical. 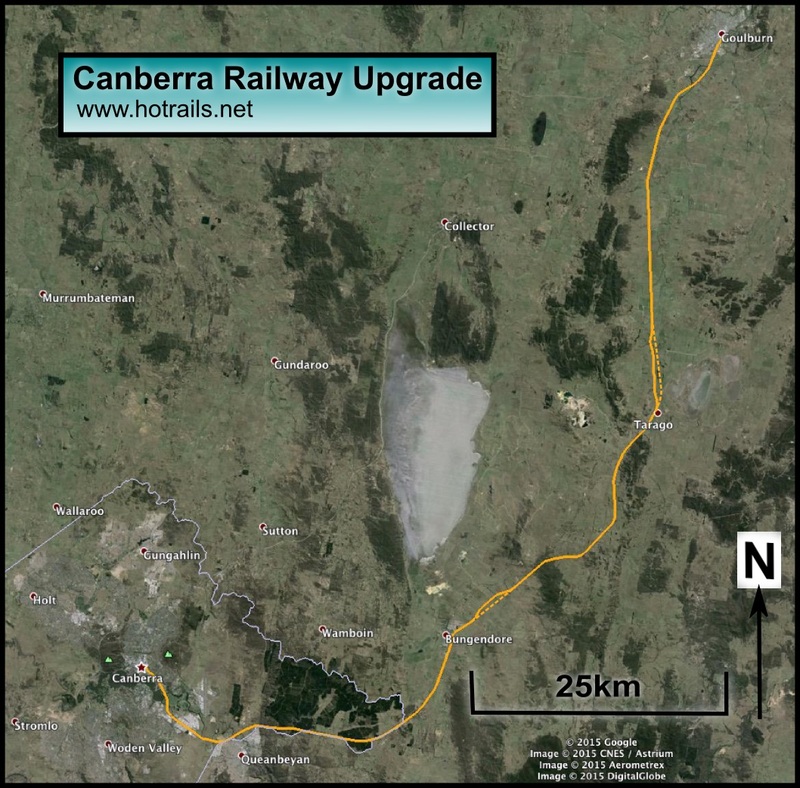 However, Hot Rails aims to follow the existing line, which exits Canberra via the Molonglo Gorge near Queanbeyan. A lucky break of geography means that a high-speed alignment can transit the range using only a single tunnel, several mid-size bridges (~100m span) and a couple of fairly deep cuttings. Once over the range, there is an easy run into and out of Bungendore, some difficult terrain between Mount Fairy and Tarago, and then a long, straight run along the Mulwaree Flats at Inveralochy. A new bridge over the Mulwaree River at Goulburn allows high-speed transit of the important regional centre. The total length of the upgraded Canberra Line is 104.4km, with construction costs totalling $1.053 billion ($10.1m/km). This is the cost to duplicate the existing line and build new deviations to enable a minimum transit speed of 200km/h. Most sections would allow 250km/h if rollingstock were capable, and over half would allow 300km/h. Modest future deviations at Bungendore and Lake Bathurst could turn this into a true “very high speed” alignment in the future, should the demand for it arise. 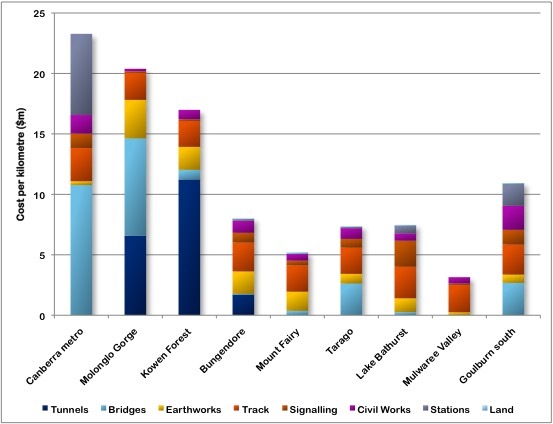 Compare the Hot Rails cost to the government study’s estimate of $2.8 billion for a much shorter spur line; measuring that alignment in Google Earth suggests it is no more than 55km in length, giving an average capital cost of $50.9m/km – over five times the Hot Rails estimate! And the Hot Rails option serves four stations in addition to Canberra. The government option doesn’t serve a single one, not even the major regional centre of Goulburn. Click on a location below to see a detailed analysis of that part of the route. This is a remarkable piece of work! The intention of enabling incremental advancement to a reasonably fast train for, say Canberra to Sydney has a huge amount going for it. But a couple of questions: as each improvement is undertaken there are presumably substantial costs in disruption to the existing lines and in the reconnection to the unimproved sections. Have you allowed for these? Second and more strategically, what are your thoughts on Canberra to Wagga/Albury/Melbourne? If, as AECOM considered, going west from Canberra to Wagga is too hard, the options would seem to be a new line to Yass or the suggested Gunning spur. If the latter, the viability of the Bungendore Taragoroute would have to come into question. As for the run west of Canberra, I’m still working on a solution to that. Even though Hot Rails is expressly NOT aiming to provide an air-competitive inter-capital link, I would like to be able to directly compare the route (and its costs) with AECOM and BZE, so plotting and costing an Albury-Wagga-Canberra route is a priority. My current thoughts are to upgrade the existing track from Melbourne to Wagga, then turn east and pick up the Hume Highway corridor and some sections of the Gundagai and Tumbarumba lines. But it’s not an easy section, that’s for sure. It might end up being easier to take the coastal route after all, with relatively easy upgrades to Orbost and Bombala, and then a short but difficult section of new track through East Gippsland and the Cann Valley. This would have the additional advantage of putting Canberra on the mainline, not a spur.